If marriages are supposed to be entered into based on true love then what place does a prenuptial agreement have in the marriage? Raising the issue of prenuptial agreement can create a ticklish situation. However, when the two people who are marrying have significantly different financial circumstances a prenuptial agreement may be appropriate. Prenuptial agreements also should be considered to be entered into when the marriage is between individuals of different ages. In cases where there were children from prior relationships, one of the parties to the marriage may seek to leave a portion of his or her assets to those children in a will. The prenuptial agreement also may be necessary to waive spousal rights of election (the spouse’s right to inherit from the other spouse’s estate). The divorce rates in New York are close to 50%. This means it is almost even money a marriage will fail. 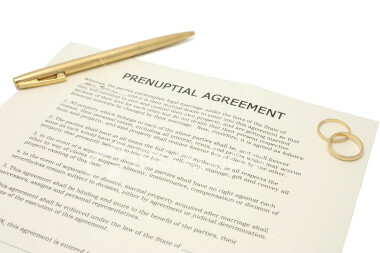 When the parties have a prenuptial agreement it helps simplify the divorce proceedings. A prenuptial agreement in this situation can save both of the parties to the marriage expenses related to divorce litigation and reduce the stress and aggravation related to the divorce. Sometimes prenuptial agreements are designed to deal with financial arrangements between the parties during the course of their marriage. Prenuptial agreements can set aside property as separate property which is not to be included in either the marital estate upon death of one of the parties to the marriage or in a divorce proceeding. Prenuptial agreements can also deal with issues of spousal maintenance (alimony) should the parties get divorced.